Home / Blog / Are Amniotic and Cord “Stem Cell” Products FDA Approved? Are Amniotic and Cord “Stem Cell” Products FDA Approved? This is an installment in our continuing series on amniotic and cord “stem cell” products. Today, I’d like to look at stem cell regulations to see whether these products are FDA approved as some claim, or fall into an entirely different category. As you’ll see, there is no approval pathway for these dead tissues, but instead a simple online registration. However, that can all change if a manufacturer begins to claim that there are live cells (whether or not that’s true). Amniotic fluid is the fluid inside the sac a baby lives in while in its mother’s womb. Amniotic membrane makes up the sac itself. You might see the term placenta used as well, and this is where that sac attaches to the mother’s uterine wall. Amniotic fluid and membrane do contain, for example, some beneficial growth factors, extracellular matrix proteins, and collagen. And amniotic and placental tissues (fluid and membrane) collected after birth have been used for a century or more in some medical procedures (e.g., in eye or spinal-cord procedures). One thing that products that are made from amniotic fluid and membrane do not contain, however, is usable stem cells. Let me explain. Fresh from delivery, these tissues do contain some stem cells; however, amniotic fluid is not a stem cell product because once the fluid is processed (concentrated, freeze-dried, chopped up, packaged, cryopreserved, etc. and then shock thawed) for use, no viable, or living, stem cells remain. We know this because we have tested amniotic “stem cell” products ourselves as has the Interventional Orthopedics Foundation. If we could obtain viable, healthy stem cells from amniotic fluid, we would be using it. When you see the term cord, or cord blood, stem cells, this structure refers to the umbilical cord that connects mother and baby. The cord contains a vein and two arteries, which is where we find cord blood. These vessels are supported inside the cord by the Wharton’s jelly. The majority of stem cells in the cord are found in the Wharton’s jelly, not, generally the cord blood. But, again, once processed, we have not been able to find any viable, or living, stem cells that remain in the cord blood. 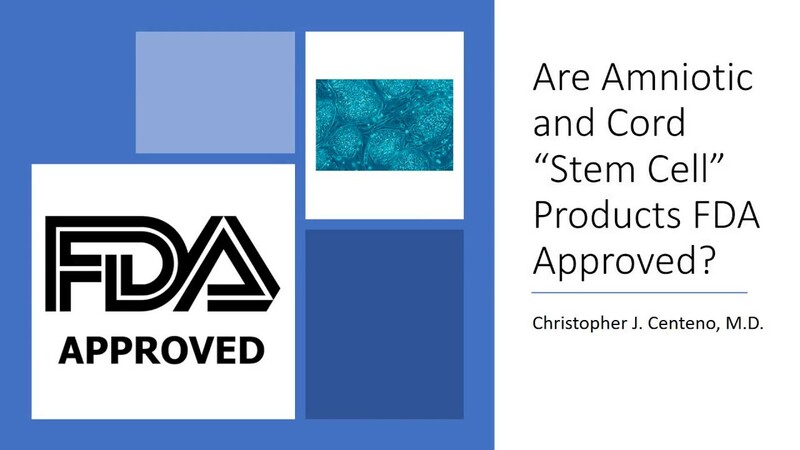 Stem Cell Regulations: Are Amniotic and Cord “Stem Cells” FDA Approved? Many pushing these amniotic and cord “stem cell” products claim that they have a stamp of approval from the FDA, so are these products FDA approved? In the world of stem cell regulations, there are two entirely different FDA pathways for donor tissues. One is the simple 361 registration, and the other is the complex 351 cell-drug approval. All of the orthopedic and amniotic and cord blood products on the market today have the simple 361 registration, which, unlike a drug approval, requires no clinical trials or data. So what’s so simple about getting a 361 tissue registration? According to the information on the form, It takes about forty-five minutes of your time to complete and submit such a registration. If you watch the video above, I show you the actual form. You just answer who you are and where they can find you and check a few boxes about what you’re registering, and that’s it. So what determines if the 351 cell-drug approval is needed? The claim of live cells (see the FDA regulation in the video above). The FDA regulation says at 21 CFR 1271.1 at section 4 part 2 that if you claim that your cells are alive and have metabolic activity and they’re a donor tissue, that’s considered a drug, and you can’t go through the 361 tissue-registration system; it requires a 351 cell drug designation for FDA approval. Also, note that it’s simply the claim that makes the difference. The cells may really be dead and all that exists is the manufacturer of the amniotic and cord stem cell products claims that they’re alive, but the claim is enough to trigger the regulation. So why aren’t these companies following stem cell regulations and just getting the proper 351 FDA approval instead of playing word games with their marketing? The 351 cell-drug designation is a long, complex, and extremely expensive process. It can take hundreds of millions of dollars and 5–10 years of clinical trials to get a real FDA approval. So the simple online 361 tissue registration and clever wording is a better fit to their bottom line. The upshot? There is no FDA approved amniotic or cord blood product with an orthopedic indication on the market today. So if a doctor or sales rep tells you that they have one, beware, it’s not true. In addition, as a doctor, if you’re using a misbranded drug that you know is misbranded, you may be in just as much hot water as the manufacturer! Just curious, you guys have tested product from the amniotic sac and amniotic fluid, as well as cord blood. Have you tested any product derived directly from the Wharton's jelly? Or is this not a product that currently exists? Or do you expect that the cryopreservation of this product would have the same effect? Thanks for your feedback. We would expect the same issues with viability in a Wharton's Jelly product. We've not aware of a product commercially available derived from Wharton's Jelly to test. So these claims, testimonials, and procedures done are fakes? I don't understand. Whom can we trust? We need help NOW. The claims of FDA approval for the use these products are being used for is False. The claims that there are live and viable stem cells in these products is False. Would I have legal recourse for being defrauded by a company claiming "live stem cells" from cord blood were viable in the injections I received for degenerative joint repair?